THE QUEST FOR CHAMPIONSHIP GOLD IS ABOUT TO GET SAVAGE AT YCS CHICAGO! El Segundo, Calif. (January 29, 2019) – Duelists of the Windy City, it’s time to Duel! The Yu-Gi-Oh! Championship Series (YCS) is coming to Chicago for the ninth time in its illustrious fifteen-year history, and some of the best and brightest competitors from across the globe will attend North America’s first Yu-Gi-Oh! TRADING CARD GAME (TCG) Championship of 2019. Konami Digital Entertainment, Inc. (KONAMI) is proud to welcome Duelists back to the Donald E. Stephens Convention Center on February 2 – 3 for the Championship debut of the year’s first core booster set, Savage Strike. From Dueling legends like Dale Bellido and Ryan Spicer to modern stars like Aaron Noel and Thomas Mak, Chicago has been the proving ground for some of the game’s greatest Champions. The latest chapter in the Yu-Gi-Oh! Championship Series will crown another King of Games, but with just one day of hands-on experience with one of the most powerful releases in recent memory, victory may go to the Duelist who’s quickest to adapt to the ebb and flow of competition. Savage Strike unleashes new support for almost every successful theme today, shaking up popular decks like Sky Strikers, Prank-Kids, Trickstars and Thunder Dragons. But it also brings new cards and new hope for fan-favorites like HEROes, Madolches, T.G. and Shiranui, and it unlocks the potential of the Salamangreat theme from Soul Fusion. It introduces the new “Guardragon” monsters too, a combo-heavy clan of serpents that could make an immediate impact in tournament play. With so much change at YCS Chicago, only the most innovative Duelists will rise to the top. The first Championship of 2019 will truly be a hard-fought contest. But with great effort comes great rewards. The prestige of a Yu-Gi-Oh! Championship Series victory immortalizes a triumphant Duelist, but their success will also be celebrated with a copy of the exclusive YCS Prize Card: Chaos Emperor, the Dragon of Armageddon! A re-trained version of the Invasion of Chaos classic, Chaos Emperor quickly found a home at the top tables in 2018. To win one is to immediately raise one’s power as a Duelist. Runners-up at YCS Chicago will earn Super Rare copies, while the weekend’s Champion will mark their achievement with a coveted Ultra Rare version. The latest in the storied line of YCS Champions will also receive paid travel and accommodations to their 2019 World Championship Qualifier (WCQ), competing with VIP status and the special perks that it entails. Both Finalists will claim an exclusive YCS-branded premium Messenger Bag, and every Duelist in the Top 8 will win PlayStation®4 gaming systems. Finish in the Top 32 and you’ll earn an exclusive YCS Top Cut Game Mat featuring Chaos Emperor, the Dragon of Armageddon, as well as World Qualifying Points, Ultimate Duelist Series Points, and an invitation to your 2019 WCQ. Two Dragon Duel tournaments will be offered at YCS Chicago on Saturday February 2 and Sunday February 3, for Duelists born in 2006 or later. These tournaments will be played in the Constructed Advanced Format. Each Dragon Duel tournament awards invitations to the 2019 Dragon Duel World Championship Qualifier based on attendance. The winning Dragon Duelist from Saturday will compete against Sunday’s Dragon Duel winner in a best-of-3 match; the winner will be awarded a Dragon Duel Championship Trophy, Super Rare set of the Darklords YCS Prize Cards and will earn the title of YCS Chicago Dragon Duel Champion! A wide range of Public Events will be offered all weekend long, including 2019 Regional Qualifiers; Ultimate Duelist Series Qualifiers; 3 vs. 3 Team Tournaments; two ATTACK OF THE GIANT CARD!! events; plus Win-A-Mat, Sealed Structure Deck, Sealed Starter Deck, Battle City, Duelist League, Sealed Speed Duel Starter Deck, and Duel Links tournaments. 1st place – Ultra Rare Yu-Gi-Oh! 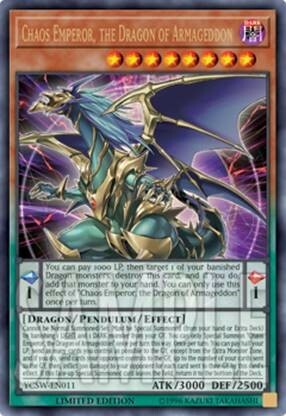 Championship Series Prize Card: Chaos Emperor, the Dragon of Armageddon; Yu-Gi-Oh! 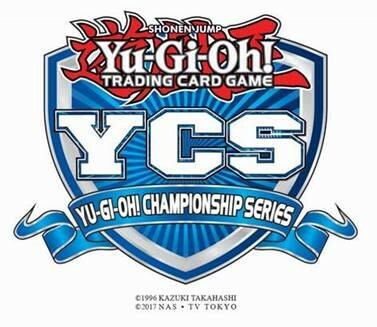 Championship Series Trophy; paid travel and accommodations to the winner’s 2019 World Championship Qualifier, with invite to compete and VIP status; YCS branded premium Messenger Bag; PlayStation®4 Pro 1 TB system; Yu-Gi-Oh! Championship Series Top Cut Game Mat; and 30 Ultimate Duelist Series Points. 2nd place – Super Rare Yu-Gi-Oh! Championship Series Prize Card: Chaos Emperor, the Dragon of Armageddon; invite to the 2019 World Championship Qualifier tournament; YCS branded premium Messenger Bag; PlayStation®4 Pro 1 TB system; Yu-Gi-Oh! Championship Series Top Cut Game Mat; and 10 Ultimate Duelist Series Points. 3rd place – Super Rare Yu-Gi-Oh! Championship Series Prize Card: Chaos Emperor, the Dragon of Armageddon; invite to the 2019 World Championship Qualifier tournament; PlayStation®4 Pro 1 TB system; Yu-Gi-Oh! Championship Series Top Cut Game Mat; and 10 Ultimate Duelist Series Points. 4th place – Invite to the 2019 World Championship Qualifier tournament; PlayStation®4 Pro 1 TB system; Yu-Gi-Oh! Championship Series Top Cut Game Mat; and 10 Ultimate Duelist Series Points. 5th – 8th place – Invite to the 2019 World Championship Qualifier tournament; PlayStation®4 1TB system; Yu-Gi-Oh! Championship Series Top Cut Game Mat; and 10 Ultimate Duelist Series Points. 9th – 16th place – Invite to the 2019 World Championship Qualifier tournament; 24 Booster Packs of Soul Fusion; Yu-Gi-Oh! Championship Series Top Cut Game Mat; and 10 Ultimate Duelist Series Points. 17th – 32nd place – Invite to the 2019 World Championship Qualifier tournament; Yu-Gi-Oh! Championship Series Top Cut Game Mat; and 10 Ultimate Duelist Series Points. Players that make the Top Cut at the YCS will also be awarded World Qualifying Points based on standings. 1st – 4th place –2019 Regional Game Mat; Dragon Duel Medal; and a Dragon Duel T-Shirt.